Provide comfort for the family of Lena Kuchan with a meaningful gesture of sympathy. Lena Mae (Rogers) Kuchan passed fron this life Friday March 8, 2019 at the age of 90. The youngest of five Rogers children, Lena Mae was born May 27, 1928, in Craig , Colorado to Will and Lena (Lippard) Rogers. Lena Mae graduated from Maxwell High School in 1946. On June 21, 1946, she married Charles Lee Kuchan. Their marriage was blessed with two children. They began their lives together in Pueblo, Colorado and then moved to Albuquerque, New Mexico for a short time. Following the death of her father in 1947, Lee and Lena Mae and their infant son moved to Maxwell, New Mexico to assist her widowed mother, They later purchased the Rogers Family Farm on which they lived and raised their family until 1968 when the land was purchased as part of the Maxwell Wildlife Refuge. They subsequently purchased land three miles north of Maxwell and in 1969 built a home where she resided for the remaining 50 years of her life. The Kuchan home was always a welcome haven for family or friends who were traveling through or coming to stay for a while. Lena Mae was an excellent cook and there was always a warm meal and a soft bed for anyone who wanted to stay. Many young relatives came to spend time with Lee and Lena Mae in the summers. The life lessons they learned and the memories that were created would have a lasting, positive effect on them for the rest of their lives. Lena Mae loved to work in her yard and garden and particularly loved her flowers, She excelled at canning and making jams and jellies. Her Raspberry-peach jam was always the most coveted auction item at the Annual Lippard Family Reunion, and it was not unusual for a bidding war to break out over it. The lucky winners might go home with $100.00 less in their pockets, but according to those winners, it was well worth the price. She was great at organizing and was happy to host numerous family events and celebrations and instrumental in planning and organizing the Maxwell School Reunions. Through the years she belonged to many local women’s clubs and the Red Hat Society. Lee and Lena Mae loved to dance and shared many happy occasions with their friends and family at the Raton Elks Club. She was a very social person and was always happy for anyone to stop by for a cup of coffee and a visit. Lena Mae was preceded in death by her parents, her brothers, Neil and Russell Rogers, and her sisters, Billie Hinds and Faye DeBault. Left to honor Lena Mae and remember her love are her husband of 73 years : Lee, her children, Roger (Toni) Kuchan of Maxwell, NM, her daughter Carlene (John) Boyd of Georgetown, TX, grandsons, Clint (Teresa) Kuchan , Jerod (Rachel) Kuchan, Dustin (Catherine) Kuchan , Matt Minehart, Josh Minehart, and Drew Minehart. Great grandchildren : Alexi (Zach) Johnson, Cole, Hannah, Hunter, Kiera, Jayce, Julia, Emily , Natalie, Reiner, Emily and Corey Kuchan, Great Great grandchildren : Karson, Greyson, and Hudson Johnson many nieces and nephews as well as other family and friends. 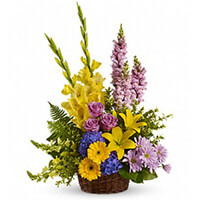 To send flowers in memory of Lena Mae Kuchan (Rogers), please visit our Heartfelt Sympathies Store. We encourage you to share your most beloved memories of Lena here, so that the family and other loved ones can always see it. You can upload cherished photographs, or share your favorite stories, and can even comment on those shared by others. The EasTex Tower Family of Employees, Jim & Pat, Roy & Jessica, Justin & Julie, and others have sent flowers to the family of Lena Mae Kuchan (Rogers). The EasTex Tower Family of Employees purchased the Love's Tapestry for the family of Lena Kuchan. 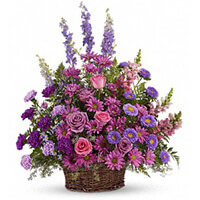 Jim & Pat, Roy & Jessica, Justin & Julie purchased the Gracious Lavender Basket for the family of Lena Kuchan. Our thoughts and our prayers for peace and comfort are with all of the family as you mourn Lena, but also rejoice as you remember her wonderful life. Carlene’s Bible Study Sisters purchased the Sweet Tranquility Basket for the family of Lena Kuchan. The Hammerlun’s, The Fullers, The Boyd’s, & Me purchased the Vivid Recollections for the family of Lena Kuchan.